LeagueGuru is India`s fastest growing Sports Fantasy Site, brought to you by the founders of PokerGuru, India's first comprehensive site on poker. Our main goal is to provide our users with a world class Fantasy Sports experience with the widest range of contests for sports like cricket, football, and for the first time ever - poker. The platform has been developed for sports fans, by sports fans, coming as we do with a history of gaming, giving you the best to indulge your sporting spirit in innovative ways, with your favorite games. From creating a team to following games in real time, LeagueGuru brings alive the joy of sporting with several firsts, never before seen in India. LeagueGuru.com is owned by Aan Infosol Pvt. Ltd, a Kolkata-based company and backed by a team comprising true and passionate sports fans, committed to delivering the best user experience at all times. Good luck and have a great time playing at LeagueGuru.com! 1. 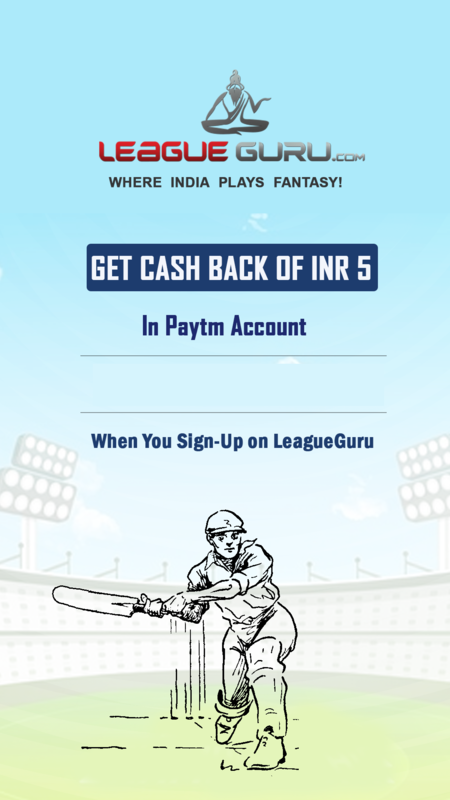 This voucher entitles you for INR 5 cashback on signing up on LeagueGuru using the promo code received on mail. 2. Both offers are valid for one time use only. 3. One user can avail the offer only once (valid on a registered email ID and contact information). 5. In case any dispute arises on this promotion, the decision of LeagueGuru management is final and binding. 6. LeagueGuru reserves the right to modify or end this promotion at any time, without giving any notice to players. 6. Verify your mobile number and email id.